David Rittenhouse was born the son of farmer Matthias Rittenhouse in Germantown, Pennsylvania. He married Eleanor Coulston, and then after her death, Hannah Jacobs. He became an astronomer, mathematician, instrument maker, and one of the leading American scientists of the eighteenth century, second only to Benjamin Franklin. Self-taught, he early showed mathematical and mechanical ability, and mastered Newton’s Principia in an English translation. As a young boy Rittenhouse constructed a model of a watermill, and by the age of seventeen he had built a wooden clock, but having little opportunity to attend school, he largely educated himself from books and a box of tools inherited from his uncle David Williams, a furniture maker. At the age of nineteen he began making clocks and other mechanical and scientific devices. Over the next thirty or forty years he made many highly-prized and innovative mathematical and astronomical instruments, most famous of which were two orreries he constructed for the Colleges of New Jersey (now Princeton University) and Philadelphia (now the University of Pennsylvania). These orreries show the solar and lunar eclipses and other phenomena for a period of 5,000 years either forward or backward. After moving to Philadelphia in 1770, Rittenhouse used both astronomical and terrestrial observations to survey canals and rivers and to establish the boundaries between many of the Mid-Atlantic States. He held the post of city surveyor of Philadelphia in 1774. His scientific thinking and experimentation earned Rittenhouse considerable intellectual prestige in America and in Europe. He built his own observatory at his father’s farm in Norriton, outside of Philadelphia. 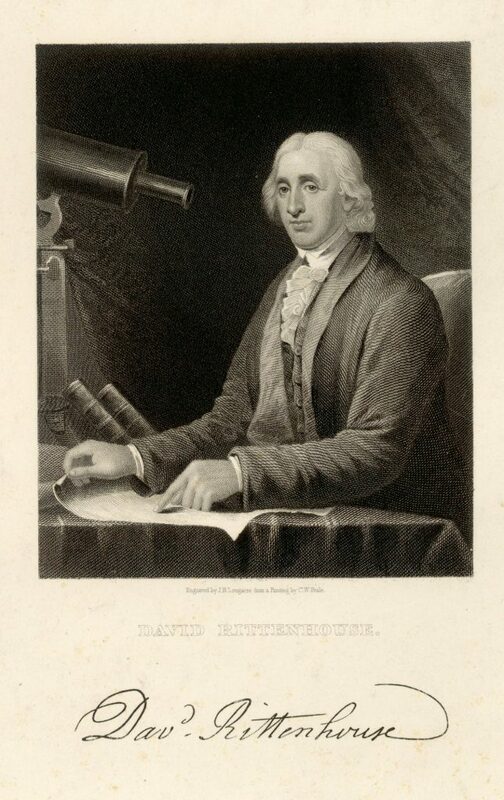 Rittenhouse maintained detailed records of his observations and published a number of important works on astronomy, including a paper putting forth his solution for locating the place of a planet in its orbit. He was a leader in the scientific community’s observance of the transit of Venus in 1769, which won him broad acclaim. He also sought to solve mathematical problems, publishing his first mathematical paper in 1792, an effort to determine the period of a pendulum. He also experimented with magnetism and electricity. Rittenhouse was elected a member of the American Philosophical Society in 1768, serving over the years as curator, librarian, secretary, vice president, and from 1791 to 1796, its president. He was elected to its committee to observe the transits of Venus and Mercury in 1769 based on plans he had made. Over the years he received a number of honorary degrees including those from the Colleges of New Jersey and Philadelphia. In addition he was elected a member of the American Academy of Arts and Sciences, and a fellow of the Royal Society of London. Rittenhouse used his scientific skills for practical purposes during the American Revolution. In 1775 he began his service on the Committee of Safety as an engineer supervising local casting of cannon, improvement of rifles, supply of ammunition, and selection of sites for gunpowder mills and magazine stores. In the late 1770s Rittenhouse was a member of the Pennsylvania Assembly, the Pennsylvania Constitutional Convention of 1776, and the Board of War. From 1779 to 1787 Rittenhouse was Treasurer of Pennsylvania, and from 1792 -1795 he served as director of the United States Mint. Rittenhouse was Penn’s professor of astronomy from 1779 to 1782 and vice provost in 1780 and 1782. He also served Penn as a trustee of the University of the State of Pennsylvania (1779-1780 and 1782-1791) and then, after its 1791 union with the College of Philadelphia, as a trustee of the University of Pennsylvania (1791-1796).